Speaking for canine intelligence, the Poodles are often referred to by a lot of people. This breed is famous with its intelligence and is known to be among the smartest dogs in the world. How close is the Poodle intelligence to that of a human? They, the Poodles, are considered to be very smart – then, what does it mean if your dog does not appear to be clever? Can the intelligence be improved? Am I, as an owner, capable of doing something to help my dog achieve all his/hers potential? 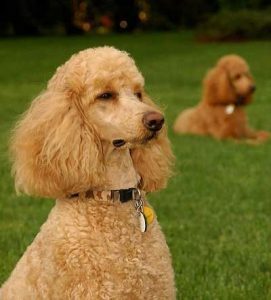 The Poodles do look beautiful with their hair tied in ribbons and they also have very regal attitude. Along with that, they are working dogs, as well, and very versatile. The breed is known to be an awesome water retriever. The dogs do not hesitate to jump into the water. Actually, their name comes from the word “pudel”, which is German, meaning “to splash in water”. “Caniche” is the word used for Poodles in France. This can be translated as “duck dog”. The Miniature Poodles would retrieve ducks from the water for their hunter or find truffles. At the same time, for companions of the people from the noble and wealthy class were used toy poodles. Regarding this, we cannot doubt if the Poodles are smart – no dog can play that separate roles and be engaged in so various tasks if not being intelligent. The description of the Poodle according to the American Kennel Club Poodle Standard is an intelligent dog that is very active, moves and acts proudly and possesses elegance. Poodles do crave for the companionship of humans and sincerely want to have part in every task. This breed would not be able to live in a secluded yard. They learn really quick and are able to figure things out. Poodles want also to please their owners. 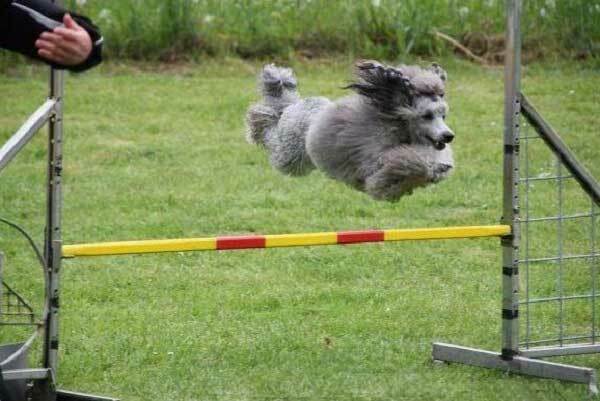 In order to help your Poodle to put his/hers abilities to work, you must ensure regular training sessions plus brain stimulations. It is a challenge to live with a dog that is that smart and easy to be trained. It can quickly learn how to act as you want them to, but they also can learn as quickly a lot of bad habits. 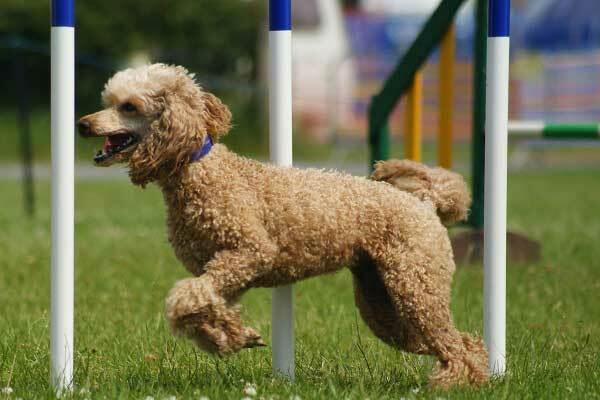 Poodle Intelligence Ranking – Are Poodles Smart Dogs? One of the professors from the Vancouver’s University of British Columbia, who is teaching canine psychology, Stanley Coren interviewed over 200 people who have professionally worked as judges at dog obedience competitions and listed the most intelligent breeds, according to their opinions and experience. Do not rush into buying a dog that is ranked at the top of the list – a smart dog is not always an easy one. Besides, there is one other fact to keep in mind – when speaking of dogs’ intelligence do not forget to consider the different types. Professor Coren says that every breed has his own type of intelligence. The Afghan Hound, for example, which came last, is a very fast runner and has an amazing hunting instincts. Then, do not take the list in heart and do not think that other breeds are less smart since the Poodles are at the top of the list for dogs’ intelligence. Humans tend to have different forms of intelligence and so do dogs. Dr. Stanley Coren had not observed or studied the dogs before listing them. What he did was sending questionnaires to people who had been judges in AKC and CKC shows. The questions were about what they think of the dogs they have observed in the shows. About 50% of the people answered, which makes 199 people. To be included, a breed should have had at least 100 responses, so not every breed was considered for the ranking. As you can see, the ranking is far from perfect; the dogs’ intelligence had been judged only by their obedience and working intelligence. That way the instinctive, the adaptive and the emotional intelligence had been left out. The above mentioned are measuring the canine’s instinct level, the ability to solve problems and the point to which a dog has evolved emotionally. A lot of people had agreed with the book when it came out, whereas others didn’t. The professor published second book in 2006. In it he had included the results of a survey among owners of dogs. Their responses showed that the owners are generally consent with the element of the dog’s trainability. You wonder how did the Poodles rank? Well, they make it to the 2-nd place. A lot of people think that this is for a specific Poodle’s variety. Actually, in this case were taken into account not just Standard, Miniature or Toy Poodles, but all of them. The top category was called “Brightest Dogs” and this was for the “most intelligent” ones. To the top, on first place was the Border Collie, and just above the Poodle (who came second), on third place was the German Shepherd. The first top-ten dogs were capable of understand whatever new command with no more than 5 repetitions. Besides, they obeyed that command from the first time for 95% of the time. A lot of people who own Poodle are proud that their dog’s breed is so intelligent. Despite this, not every Poodle shows that much cleverness and this bewilders their owners. This will be a topic of discussion after a while. Do all the Poodles possess such an amazing intelligence? Why isn’t my dog that smart? The dogs that were part of the listing were judged among show dogs. These already had experience on the ring and had had training how to carry out commands and how to perform heeling techniques. Yes, the breed has a huge learning capacity and is very intelligent. Still, the puppies and the adult dogs need to be trained to respond to the commands you use. That is why it is so important for you to know how to train your dog properly. There is not one single way in which the intelligence can be measured and ranked. Obeying commands is just a part of the “intelligence equation”. You have to ensure the proper live for your dog to live up to his abilities. That way, the dog will not only obey commands but will also understand the world around him/her and will know how to interact with it. We’ll explain more after a while. 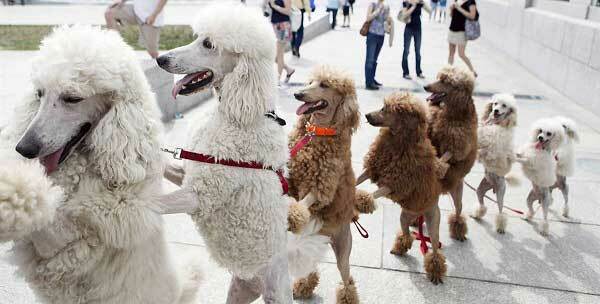 Before that, let us show you some tips for proper training of the Poodles. Following our advices, you will ensure that your dog has developed the abilities to obey commands and your pet will deserve his/hers place in the “high intelligence” rank. Train your dog only one command at once. The first one should be “Sit”. You should be in mood for training and so does your Poodle. Your dog will not be capable of training is he expects to eat or to go for a walk, if he is tired of distracted. And if you are distracted, stresses or in a rush, you will not be capable of teaching properly. It would be easier to train your dog if you have a complete guideline, so obtain one and follow the instructions written in it. One very important aspect of your dog’s intelligence is the ability to understand speech. Yes, this is important when learning a command because your Poodle must understand the command in order to obey it but there is more. Generally, a dog can learn to understand up to 165 words. First, some of them will be ‘cue’ words – for example, “meal time” or “walk”. Second, the dog’s “vocabulary” can include names of people as well as these of places. Your Poodle can even learn to understand what do the words “sun”, “snow”, etc. mean. If you spend time in teaching your dog words, then your Poodle can learn to understand even up to 300 words. Before, people thought that dogs have short term memory. Now, we know that this is wrong. Dogs do have both long and short term memory. Yes, a dog might forget what have happened several minutes ago (because of this there is no use of yelling to the Poodle about a housebreaking accident if it had happened before some time). Still, if the Poodle receives repetition, that thing will move to the long term memory and will be stored for a long, long time, even forever. To prove that, we will remind you that some dogs have been lost for very long time and still managed to get back home, remembering not only their owners, but the location of the house as well. Let’s say that you want to learn your dog to do thing A. Then train him to obey the command about thing A several times every day and he/she will soon understand and remember it. Another aspect of intelligence which is measured by the use of all of one’s senses in order for one to understand the world. When it comes to sound and smell, dogs are much better than we are and they also can see in the dark better than we can. Actually, according to some estimations, dogs are able to see light that is 5 times dimmer that a person can. Considering this, we can easily say that since the Poodle is aware some things that we are not, than the dog is smarter, in a manner of speaking. One other very interesting fact that should be considered is that dogs are able to perceive the Earth’s magnetic poles. When measuring the intelligence, it should be remembered that the emotions rate also plays a role. When a human baby is born, he/she does not have the ability to feel and express every possible emotion. They develop those abilities through the first few years of their lives. Babies can experience only excitement, however weird that might sound for someone. “How can they smile, then?”, someone may wonder. Others probably would want to know is this shows happiness. It is said that the smile begins only as a neurological activity (an involuntary one). When babies rech three months, they start smiling as a social interaction. Shortly after that comes the ability to show actual happiness. While they are growing, they start expressing more emotions. This happens as follows: excitement, distress, contentment, disgust, fear. Then comes anger. After this they develop the ability to experience joy, suspicion, shyness and affection. And, finally, there comes love. All of these emotions show up before the baby reaches one year. Here becomes the separation between dogs and people. A lot of people (among which is Dr. Stanley Coren, who has written the Intelligence of Dogs) think that dogs do not develop the next emotions, which are shame, pride, guilt and contempt. People who own dogs argue over this. If you have read the AKC Poodle breed standard, then you know that there is written that the Poodle moves soundly and very proudly. Owners admit that their Poodles had shown shame after doing something bad in the house. The debate about the dog breeds’ ranking will go on and so will this over the types of abilities that should be used for the measurement of intelligence. Still, it is admitted that canines are quite intelligent. A dog is capable not only to understand words, but to feel and express emotions as well. He/she can also solve problems, to reason and socialize, et cetera. 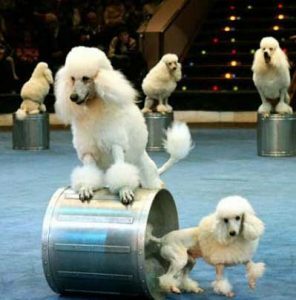 Poodles have a long history of being performers in the circus and this also proves how smart are they. Poodles have had a lot of jobs. They have a history of being circus dogs as well. These ones had performed awesome tricks for the audience. For this work they must have been able to adjust quickly to an unfamiliar place, to avoid reaction provoked by noises, crowds and other animals. They had to be not only enthusiastic, but also calm and under control when needed. A lot of people (traveling performers and gypsies) used to train, dress up and let Poodles perform tricks. Others used to sculpt the dog’s coat and to do a fancy hairdo, increasing the appeal on the stage. And this happened not only in the past. Today, this breed is also being used in circuses or dog shows. How smart are poodles and how Poodle’s intelligence rank compare to that of a person? It is possible that some of you wonder how smart would a Poodle be compared to human, since it is one of the top dogs on the intelligence rank. Actually, canines are at the level of a 2 to 3-year baby, so if you have a Poodle at home it is the same as having a toddler. No one has studied the closeness of the Poodle’s intelligence to the humans. Do not forget that the Poodles take the second place because the rank was made only on working and obedience factors. It is not of little importance that Poodles are as smart as a 2 or 3-year kid. Children this age are able to solve problems, do possess curiosity and enthusiasm to explore, can reason logically, have motor skills and do enjoy their senses. “Why can’t they learn to be smarter – like a kid of age 4 or 5?”, you might ask. while working on this analogy, two elements have been considered. The first one is how many emotions can a dog experience and the second is the aspect of self-recognition. Self-recognition is the ability of one to know when one is seeing oneself while looking in the mirror. Humans develop this ability while during the period from 18 months to 3 years. And that is one of the reasons why the Poodles are said to be as smart as a 3-year-old child – because they are not able to recognize themselves while looking in the mirror. Marc Bekoff, former Ecology and Evolutionary Biology professor thinks that since the dogs aren’t visual creatures, they would actually identify themselves not on sight, but on scent. How to Help Your Poodle to Be Even Smarter? If one dog is being isolated, he/she cannot learn how to be social. If a dog is not spoken to, he/she cannot learn words. And if you do not teach your dog commands, how do you expect he/she to obey them? A Poodle is able to learn and understand a lot of things. Still, in order for him to reach his full potential, you should give him this opportunity. We already stated that a dog learns by repetition. So, if you are planning to help your dog become smarter, you should train him regularly, not just once a month but daily. Do you wonder where to start from? Canines hear and smell more than we do. They also tend to love using these abilities and if you allow them to, the dogs will practice their skills and will also have an increased level of contentment. Take your dog outside, leave him smell new scents and let him see and hear new things, respectively sounds, and this will bring him happiness. If your dog is hyperactive, then regular training or exercising sessions will help him calm down and will lead to better behavior. And last but not least, if you regularly take your Poodle out, you are providing him a wonderful opportunity to socialize with new settings or events. Poodles are able to learn at least 200 words. But they do have a big intellect capacity, so if you make an effort, your dog can learn up to 300 or 400 words. And with more words in his vocabulary, the communication between you and your dog will be much better. This can be a two-way street, no matter that the dogs cannot speak. Instead, the Poodle may perform a specific action you have told him to (fetch the remote, for example, or mouth his leash). He can also become better in understanding when you talk to him (and relax if told that a specific noise is not a reason for alarm, for instance). If you want to teach your dog to understand the words for certain objects, here is what you should do. First, choose 3 of them and place them in a line. Then, while picking each up, you should say its name, articulating clearly. This should be repeated a couple of times or more. After that allow your dog to paw, nose or mouth the object which name you are telling. Praise the Poodle when he or she is correct. But, if the dog is still learning, be patient. If you want to train your dog to follow commands, ensure that you have a good guideline in your possession. With it you will be able not only to make your training sessions fun and to be more effective but will also reach your goal more quickly. How to train the dog’s mind? Do you want to offer your dog a way to train his mind? Then buy him some kind of puzzle and let him try to figure it out. The puzzle might be homemade, as well. If you want to make one, then hide treats under cups, that you have turned over. Then all you have to do is let your dog try and find out where the reward is. If you want something more effective, then you should try a game that is played not only by the dog, but also with the owner. These canine games require that the owner plays as well and he shows the dogs how to do something (how to paw a button, for example), while the goal of the action is to show or release a treat. These games have different levels. That way, while your dog becomes smarter, the game can become more and more challenging. The methods mentioned above are not only working but are also a great way to form a stronger bond with your pet, since you two will work the problems out like you are teammates. It is not very easy for the Poodles to live up to their second place in the “most intelligent dogs” ranking. This can also confuse the owner if he expects that the cleverness will come itself and his dog will do everything he asks him to do. As every human has different intellectual capacity, so does the Poodles. For example some of the dogs might be pretty good in following commands, but to have a hard time in socializing with other dogs and with humans. What we know for sure is the fact that a dog cannot be smarter than his learning opportunities allow him. No matter if you have a toy, miniature or standard poodle just train him, spend time with him and love him and he we’ll show you his potential.